If you are suffering from golfer’s elbow or tennis elbow, you need a brace that is specifically designed to support your elbow and feel you better. At Sandalwood Physiotherapy, we provide elbow braces in Brampton & Caledon that helps to improve the effects of injury or instabilities and postoperative recovery. Whether you are a tennis or golf player or active in other sports that put pressure on hand or wrist, the elbow injury will be familiar to you. 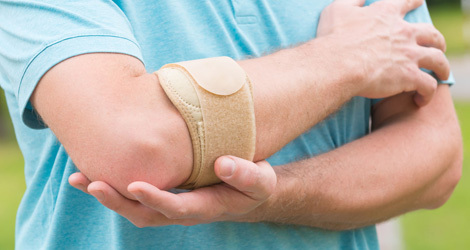 To heal this pain and prevent the injury, you need to consult professionals for elbow brace. What Causes Pain In Elbow? Elbow brace reduces the pain caused by tight or tensed muscles. Using elbow braces, you can reduce the cost of weekly therapy. Use of these braces is less painful than surgical procedures for the treatment. It also prevents the progression of chronic injury. The elbow supports should be utilized in certain orthopedic elbow conditions. Our professional orthopedists, chiropractors and physiotherapist in Brampton & Caledon can provide you with sufficient solution for elbow pain and relevant issues. Schedule A Free Consultation For Elbow Braces!